A couple of guys out in DC are making waves in the real estate investment world, and I think it’s worth Marin taking a look. You can invest in buying your own home. But you can’t buy into a true real estate deal unless government regulators believe you’re wealthy enough to know how to handle your own money. Until now, the Millers themselves have been restricted to raising funds from accredited investors they personally know. This is how the system works: If you want in, you must know the right people and have enough money – six or seven figures’ worth. This stifles investment in small properties because the folks with the money typically also don’t want to invest in small projects with low margins, or in the eclectic business plans that make retail corridors so diverse and interesting. Long story short, they figured out how to do it legally, through the SEC’s little-used Regulation A, and they want to expand the idea. Now, the Millers’ pilot project was renovating a store on a half-blighted retail corridor in the District, but the concept, which they’ve packaged under the company Fundrise, is transferable to anywhere in the US, and that’s where Marin comes in. To for-profit developers, Marin poses a bit of a problem. The development environment –very short height limits, restive neighbors – makes it unprofitable to invest in most small projects. Yet nonprofit developers pose a problem for county and local budgets, immune as they are from parcel and property taxes. Yet Marin has fantastic wealth and a highly involved, business savvy people. Entrepreneurs should be able to tap into this talent pool to fund projects that really aren’t outside developers. Perhaps those restive neighbors who drive out developers could end up funding their own developments. There’s no shortage of vacant lots or sub-par uses. San Anselmo has that rotting partially-finished building on Sir Francis Drake. San Rafael has a huge vacant lot on Lincoln and Mission. 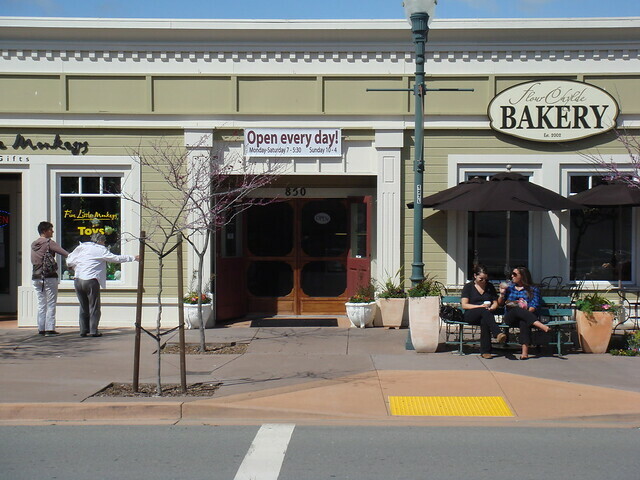 Novato has its own vacancies, as does Mill Valley. The Town of Corte Madera took up the role of investor by buying out a rapidly declining shopping center. From Dillon Beach to Sausalito, there are a huge number of opportunities. Rather than walk by and wish something else were there, you and your neighbors could actually do something about it. Why wait for George Lucas or Phil Lesh to swoop in? If the community wants something in a location, Fundrise could offer a way for the town not just to build or renovate but to literally reinvest in the community. It’s like It’s a Wonderful Life, but with real estate securities instead of bank loans. Well, you might say, this is a bit crazy. It’s too risky, too legally convoluted, for use outside of a few projects out in DC. But it’s not just the Millers who want to do this; it’s coming from California, too. A common complaint about me is that I live in DC, that I don’t ‘get’ Marin, and so have little right to comment. It’s a silly argument, but it does reflect a zealous protection of Marin’s quirks and special character. Who gets Marin better than Marinites? And who would know better than Marinites how invest in their own community? In other words, Marinites, not big developers, would build the towns they want. Marin wouldn’t need big developers to swoop in and fill vacancies. All we need is an entrepreneur and a business plan the community could get behind. Ruin Marin? Hardly. It would be Marin.